These unique little bags use two burlap quilt blocks stitched together. Layers of vinyl and organza are used to create the window for the light to shine through, creating a beautiful glowing effect. 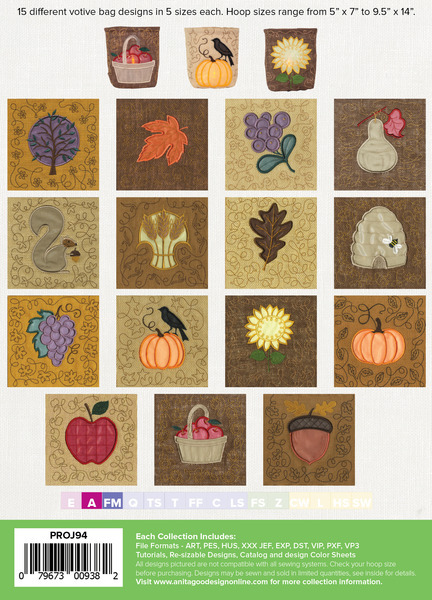 The finished projects will look great on your porch, mantle, or table. We created these bags using two quilt blocks stitched together. The unique part is that, instead of cotton, we used burlap fabric as the base and then created leaves in the center of the bag using organza and clear vinyl. We wanted to be safe, so we used battery powered votive candles to finish the project. The finished projects will look great on your porch, mantle, or even as a centerpiece for your table. These projects are sew unique you will love them! 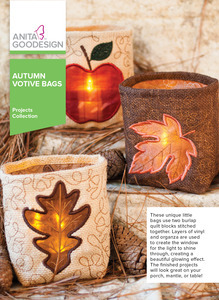 15 different votive bag designs in 5 sizes each. Hoop sizes range from 5” x 7” to 9.5” x 14”.